Entrepreneurship in harmony with people and the environment is a central concern for the DMK Group. It was decided in 2012 to develop a sustainability strategy that would provide guidelines up to the year 2020. Following a process conducted with internal and external stakeholders, "DMK 2020" was published in mid-2013: The ambitious sustainability programme set a total of 60 goals in five areas with 20 fields of action, and underpinned the goals with actions and indicators (ratios). The company reviewed every year how far the goals had been achieved and published the results in the combined annual report and sustainability report. In 2017/18, the DMK 2020 strategy was comprehensively reviewed and updated. This was required because the company had already achieved 25 of the 60 goals by 2016 and a number of framework conditions had changed. For example, in 2015 DMK launched the Milkmaster Programme, topics such as animal welfare and climate protection have gained even more in importance in the past few years and the new organisation structure with the six business units had not been previously been taken into account significantly in DMK 2020. The update of DMK 2020 will take these changing framework conditions into account and focuses in the five areas of agriculture, environment, milk, team and society on a total of 10 topics with clear goals up to the year 2020. A comprehensive, solid structure is needed to implement the ambitious DMK 2020 programme. The Sustainability Management, within corporate strategy, coordinates and manages all sustainability activities and represents DMK with external stakeholders and in professional working groups such as industry initiatives. Strategically, the Management Board and executive bodies and the Council for the Future and Sustainability are responsible for its direction and for overseeing its progress. Operationally, the work is performed by the responsible business areas, which meet regularly in the Sustainability Working Group, and site officers, e.g. for health and safety, environmental protection and energy management. DMK has identified and analysed eight groups as stakeholders, what expectations these stakeholders have and what formats DMK can use for two-way communication with these groups. The stakeholders' expectations have been incorporated into the development of the DMK 2020 sustainability strategy. Stakeholders were also surveyed for the GRI-G4 materiality analysis and their requirements and expectations were identified in detailed analyses. 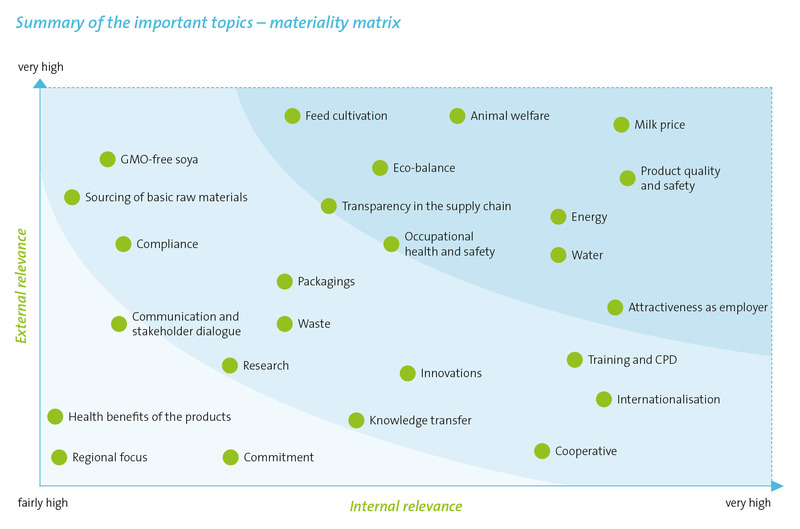 The materially important topics were summarised in a materiality matrix. A number of formats are available for regular exchanges of views with stakeholders.